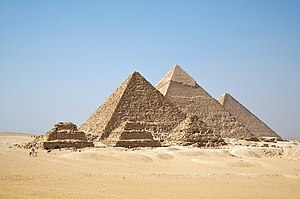 Giza or Gizah (Arabic: الجيزة‎, transleeteratit el-Gīzah) is the third lairgest ceety in Egyp. It is locatit on the wast bank o the Nile River, some 20 km soothwast o central Cairo. Alang wi Shubra El-Kheima, Cairo an Helwan, the fower ceeties form the Province o Greater Cairo metropolis. The ceety o Giza is the caipital o the Giza Govrenorate, an is locatit near the northeast border o this govrenorate in coordinates. It is locatit richt on the banks o the River Nile. 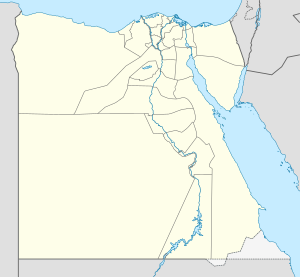 The ceety's population wis 2,681,863 in the 2006 naitional census, while the governorate haed 6,272,571 at the same census. Its lairge population makes it the seicont lairgest suburb in the warld, tied wi Incheon, Korea an Quezon Ceety, Philippines, seicont ae tae Yokohama, Japan. Giza is maist famous as the location o the Giza Plateau: the site o some o the maist impressive ancient monuments in the warld, includin a complex o auncient Egyptian ryal mortuary an saucrit structures, includin the Great Sphinx, the Great Pyramid o Giza, an a number o ither lairge pyramids an temples. The plateau an its monuments hae been recordit in the Giza Plateau Mapping Project run bi Ancient Egypt Research Associates, directit bi Dr. Mark Lehner. AERA's 2009 field season was recorded in a blog. The Great Pyramid o Giza at ane time wis advocatit (1884) as the location for the Prime Meridian, a reference pynt uised for determinin a base langitude. "Mn Nefer" (Memphis, in Greek) - which means "the bonnie wall" in the ancient Egyptian leid -, the caipital ceety o the first unified Egyptian state since the days o the Pharaoh Narmer, lies nearly 20 km sooth o Giza. Giza's maist famous archaeological site, the Giza Plateau, haulds some o the maist astonishin monuments in Egyptian history. Ance thrivin wi the Nile that flowed richt intae the Giza Plateau, the pyramids o Giza wur built owerleukin the auncient Egyptian caipital o Memphis, which wis near modren day Cairo. The Giza Plateau is an aa hame tae mony ither ancient Egyptian monuments, includin the tomb o Pharaoh Djet o the First Dynasty, as well as that o Pharaoh Ninetjer o the Seicont Dynasty. Wikimedia Commons haes media relatit tae Giza. This page wis last eeditit on 10 Mairch 2018, at 19:28.